Martha Dog on her first night here. A woman I’d met in Boston Terrier rescue sent me the photo. 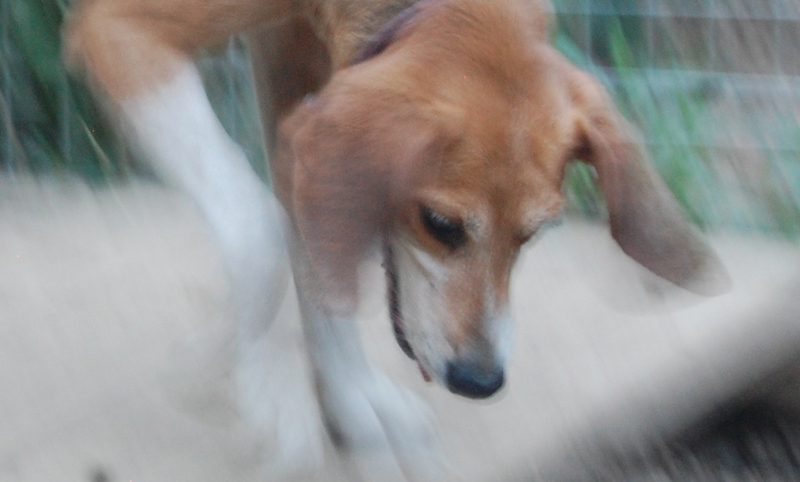 Did I know how to contact anyone in American Foxhound rescue, she asked. I wrote back to her. There is no American Foxhound rescue. American Foxhounds are one of the rarest breeds in the American Kennel Club. There are probably fewer that 20 of them being shown in the country right now. But truly the breed is not rare. In the south, particularly, they are a popular hunting dog, used for trail hunting on deer, coyote, foxes. It’s not that unusual to find them in pens of ten, twenty, a hundred. The same in the mid-Atlantic region where they run in huge packs alongside horses and riders. Even good hunting dogs get lost. The National Bench champion from three years go ran off with the rest when the hounds were “cast” during the final element of competition, and was never seen again. Dogs who are troublesome are turned over to shelters, or simply turned loose. It takes an educated eye to distinguish an American Foxhound from its cousin, the Treeing Walker Coonhound and in fact, the popular tri-colored Foxhound is often referred to as the Running Walker. 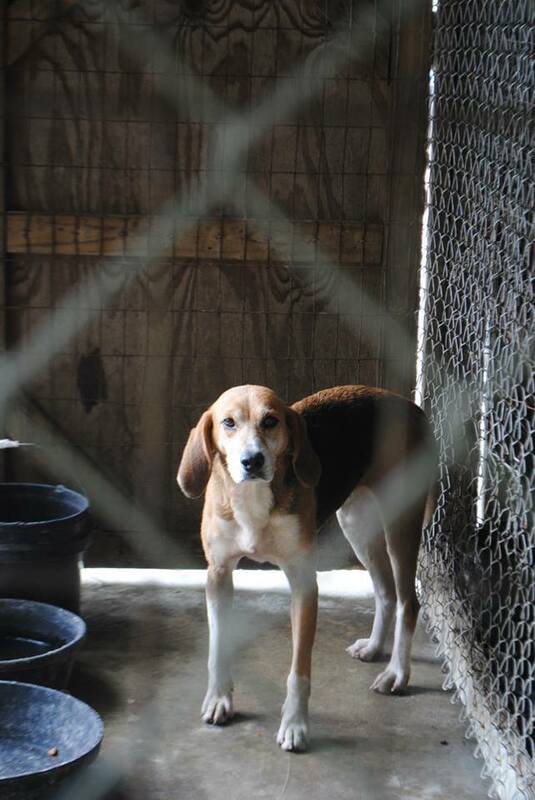 This is a long way of getting to a short brutal fact: the southern pounds and shelters and rescues are full of tri-colored hounds, and there is no specific rescue to spring them. They are often not placed from shelters because they don’t do well with overstimulation and they tend to cower in the runs. They can be a handful for first time dog owners– any hound can. They are the most independent of the dog breeds. They love to sing. They can scale fences and any hole they can get their heads through, their limber bodies soon follow. I have a small pack of Foxhounds, retired show dogs who sleep on sofas and eat ice cream on their birthdays. 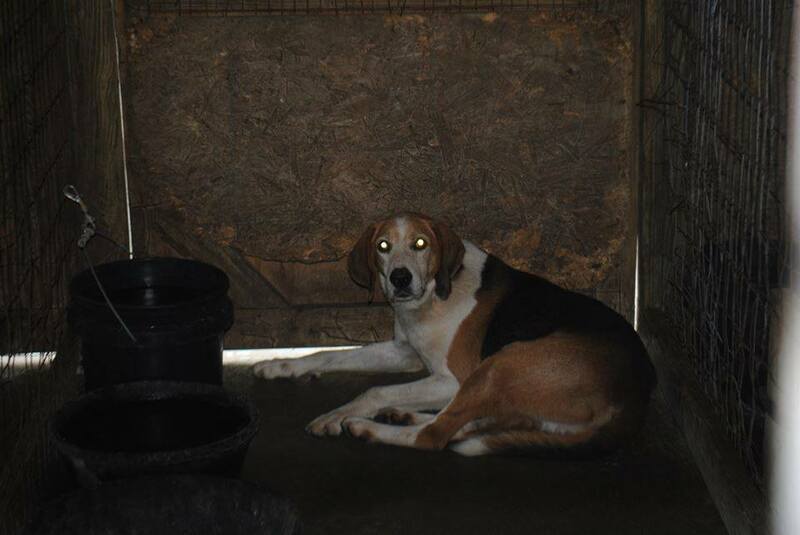 It hurts my heart that there is no organized rescue for Foxhounds and truly, I just try not to think about it. The woman wrote back. These two hounds were in the Johnson County Garage, because Johnson County, Kentucky doesn’t have a shelter. They’d made a few pens in the county garage and some very dedicated and hardworking women labored tirelessly to place the dogs and cats that came in– because those that weren’t placed by Friday afternoon went to animal control the next town over, where they were killed. I looked at Johnson County on a map. There was a guy there who’d bred Foxhounds in a town there. He had the sire of one of my dogs and the grandsire of another. I looked at the picture of the dogs more closely. Was that a familiar profile I saw? Were these dogs family? There was a dog show in Lexington beginning on Thursday. I was going that far already. How much farther could Paintsville be? Quite a bit farther as it turns out, more than 100 miles through the Appalachian mountains. We were pretty much broke. It took some careful finagling to get together the money to buy gas drive just to Lexington. Feeding two more hounds wasn’t really a move in the right direction. I went anyway. Another Foxhound exhibitor gave me $40 to buy some extra dog food. I figured I’d get them home and place them. At least they wouldn’t be dead. Yeah, they seemed a little long in the tooth. And yeah, there’s not even much of a market for Foxhound show puppies, but maybe someone would step up. A woman met me in the parking lot of Tractor Supply in Paintsville. The hounds were in crates in the back of her pick up. I opened up the back of the Jeep and she helped me load them. First the male, then the gyp. The male looked so old and tired, I wondered if he’d survive the trip home. My own Foxhound girl, clean and shiny for the show, seem to recoil in her crate. One look told me what my head should have known anyway. These dogs weren’t related to our dogs. They were Foxhounds, certainly. From someone’s pen, no doubt. But there was no way I could say no at that point. It was Thursday afternoon, they only had a few hours left. I called my husband to tell him I was on my way home. I stopped at a gas station just outside the on-ramp to US 52 to put a bit more gas in the tank, get an iced tea, walk the dogs. “Just wait a minute, Gracie. Let me walk these two first.” The old pair hopped out of the back and went along pretty happily on leashes with me through a vacant lot. Gracie howled her displeasure from the Jeep. With a deep sigh the male dog squatted and deposited a pile of turds as big as a cantaloupe. Within minutes, the other one too had left a steaming mountain — they must have been holding it in for a few days. I came back with Gracie and some plastic bags to clean up after them. Gracie stood far away, with one delicate foot poised in the air, watching me bag the evidence. When we got home, my husband was annoyed, but resigned. He knew what he signed up for when he married me. We put the old dogs in a run for the night, he was tender with them. I knew what I signed up for when I married him too. The dogs seemed quite happy. We called them George and Martha, after the Washingtons. George Washington developed the American Foxhound by crossing French staghounds with the slower English Foxhound in order to create a dog that could give chase to the quick brown fox. For a few weeks George and Martha lived happily in the kennel run– they had a dog house and seemed content. They’d been fed communally and even though we brought them separate dishes, they’d eat first out of one bowl and then out of the second. Neither wanted to come inside. Then Martha came into season, and she had to be separated from George. Then the autumn chill came on, and George had to come in as well. It was quite an ordeal to get him into the kitchen as he seemed certain that his life would end in many a hideous fashion if he crossed the threshold. It’s an unfortunate trend that people like to talk about what awful lives their rescued dogs must have had before they came to live with them, as if the worse it was the more virtuous that made the “adopter” or “rescuer.” Shelters feed into this by embellishing or creating terrible life stories to go with each dog. Were George and Martha abused? Probably not. They weren’t well socialized– they’d been hunting dogs. Maybe they’d had more rough handling than tenderness, but they still looked to people for affection. Who’s to say how they came to be trotting down a highway in rural Kentucky one morning, but the only one who ever came for them was me. I kept telling George and Martha when they arrived that this was just a way-station for them, just a stop on the journey to their forever homes, and they would look at me and smile and wag their tails as if they knew different. I guess they knew different. You can probably figure the rest of the story. Eighteen months later George and Martha are still here. I never did get around to even trying to network them. Occasionally my husband grouses about the extra mouths to feed, but they’re old dogs. They’re happy here. A commitment to the “rest of their lives” is no more than a year or two. George spends most of his time hanging out with two of our other dogs. I would have said originally that George and Martha were a bonded pair, but really Martha has little patience for George. George is not the smartest of dogs– he’s easily confused. I believe now that he is quite profoundly deaf. Martha sleeps in my study. If we move her bed she can’t find it, but she sees well enough to get around the house and mosey through the yard. She is always cheerful. She loves the sound of her name, a bowl of her own, cookies at bedtime, a soft landing. So touched by your story. How are the dogs now? 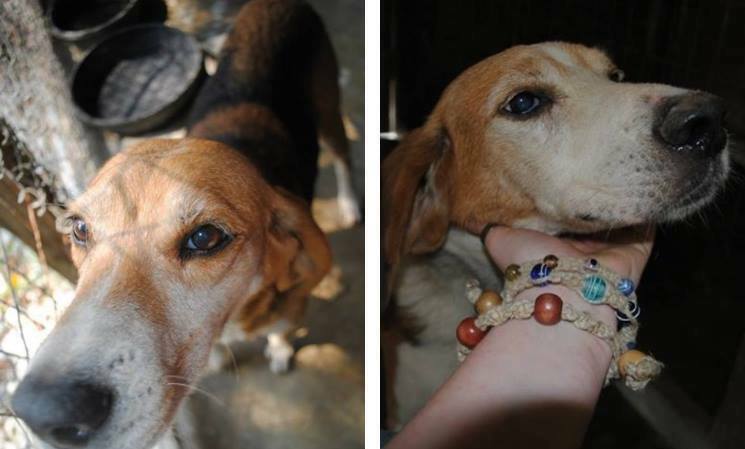 I was looking for a foxhound rescue and came across your blog. I have a stray here that I’m afraid will be shot by redneck neighbors. Any ideas? She’s never hurts the cats , just chasing them everywhere!